Some of the looks to prep for, some just have to be seen. "In a world of homogenous short-backs-and-sides, the fashion troll is the lid to give male grooming the shake up it needs in 2019" - Esquire. Yes, that's a comment on just one of the beauty trends seen on the runways at Men's Fashion Week. Now that the menswear Fall/Winter 2019-20 collections have gone down in London, Milan, Paris and New York, let's look at the key beauty messages coming your way later this year. Some you'll want to start preparing for… others are guaranteed to give you a good laugh. Forget growing your hair out and tying it up in a man bun; the next hair trend will have us styling our hair like Troll Dolls — at least according to Thom Browne. The NYC-based menswear designer sent his models down the runway sporting up-combed hairdos reminiscent of those little plastic toys of early '90s fame, with furry, up-combed hair. The super editorial look obviously isn't for everyone, but we'll jump on the Fashion Troll bandwagon and agree there are probably some fashion forward guys in Canada that could pull this look off. All you need is medium-length hair, and an entire bottle of hairspray to ensure that you really stand out in a crowd. Pun intended. If Thom Browne's Troll Doll look isn't for you, there were plenty of other popular hairstyles that made appearances on runways across the globe to inspire you. The extreme side part made a return at Hedi Slimane's debut menswear collection for Celine. The look is trademark Slimane, but the casual styling was just another signal pointing to the end of certain styles; disconnected quiffs and modern undercuts. A subtle nod to fashion watchers that it might be time to end our love affair with the severe disconnection from the top, back and sides and just start growing our hair out. Another hard to miss hairstyle seen repeatedly at the shows? Ultra-tousled, and messier-than-ever! Need an example? The bedhead 2.0 trend was pretty hard to ignore at the Dior show in Paris as designer Kim Jones showed his second collection for the brand. Countless models rocked a new take on bedhead — don't be confused, this dishevelled 'do has been painstakingly styled with product. If you are going to take this one on and do it properly, you'll need to ensure your disorganized hair is, well, organized. 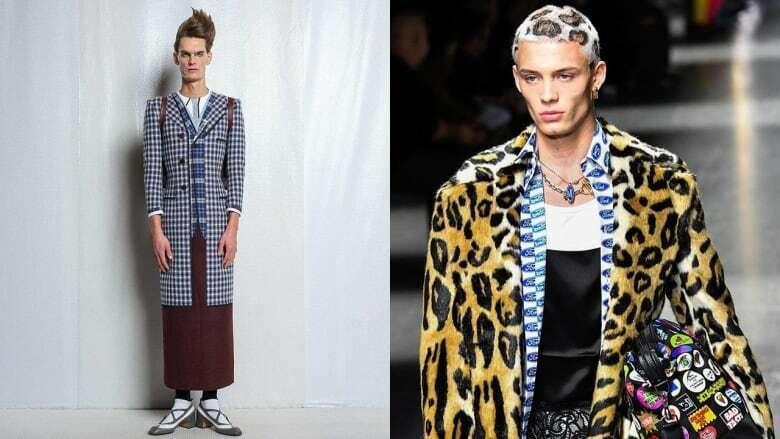 The most outrageous hairstyle to make an appearance during theFW/19 menswear shows was the leopard-print buzz cut that made its high-fashion debut on the Versace runway. Model João Knorr sent social media into a frenzy when he walked down the menswear catwalk in Milan with his hard to miss hair. Hairstylist extraordinaire Guido Palau was responsible for Knorr's matching animal-print dye job. Backstage, Knorr's bleached buzz was spray-painted with brown and black spots, urning the model into a Versace club kid. "The hair-coat match was everything," Donatella Versace exclaimed after the menswear show on her Instagram, posting a shot with Knorr. At the highly anticipated Yohji Yamamoto presentation in Paris, the Japanese designer sent models down the runway sporting colourful hair in frosted tones that completed the melancholic mood of the collection. Off the runway? J Balvin stepped it up in the name of Paris Fashion Week and sat in the front row of some of the hottest shows showing off his new psychedelic buzz-cut. The "Mi Gente" hitmaker definitely turned more than a few heads with his intricate Lisa Frank dye-job. Countless labels have launched cosmetics targeted at men in recent years (Chanel and Tom Ford to name two), and seeing bronzed up bros on the runway is nothing new. What was out of the ordinary was the can't-miss statements, like at Rick Owens. According to Owens we should just forget about trying to maintain any of next summer's glow into fall. The designer opted to give his models, making skin plaster-white, chalky-textured, for a ghostly aesthetic.